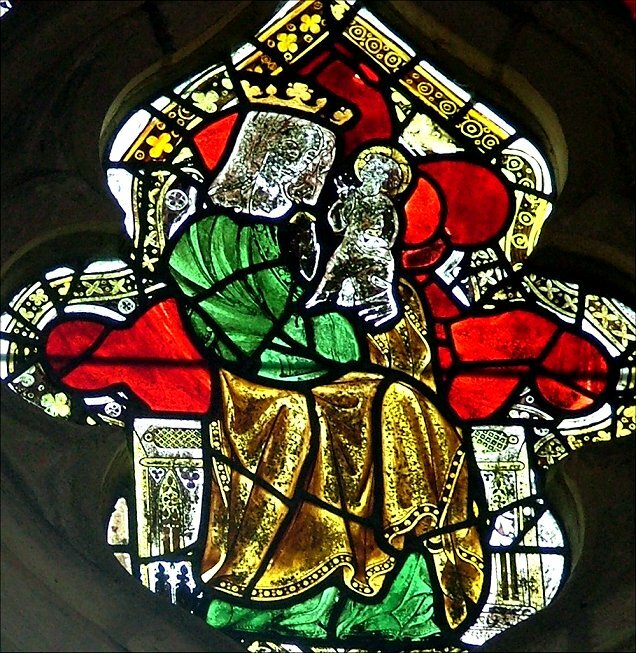 North Elmham was one of the early sites of the Bishops of East Anglia - there was a cathedral here for more than a hundred years at the start of the last millennium. 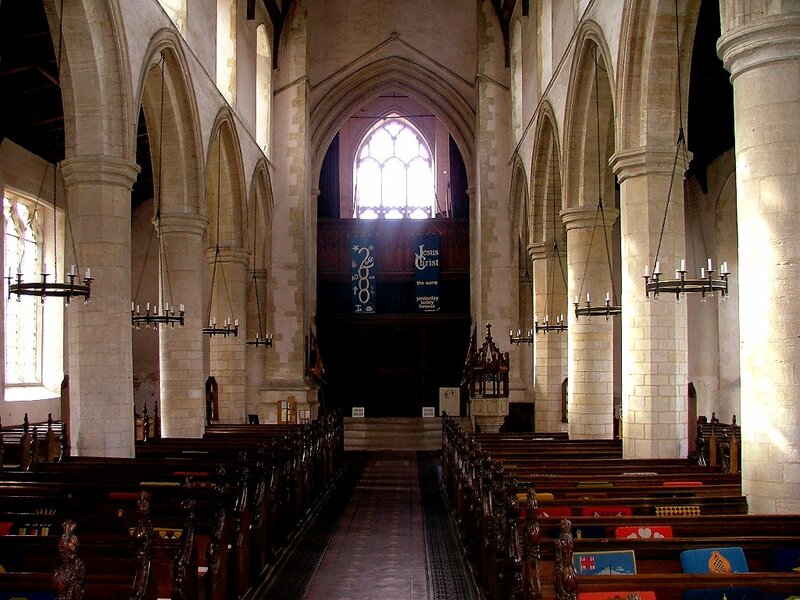 In 1073 it was moved to Thetford, and then to Norwich, where both Bishops of East Anglia, Catholic and Protestant, have their cathedrals today. 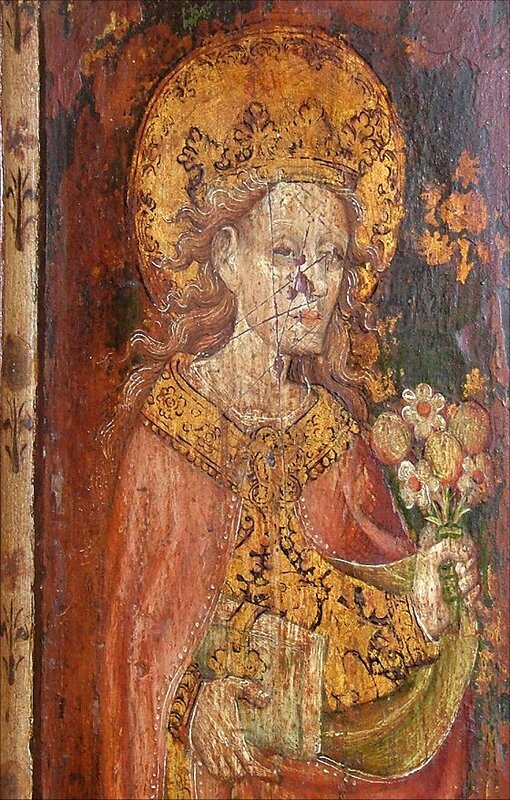 No trace survives of the North Elmham cathedral, which was almost certainly a wooden building. The Normans probably moved the See away from here because this little village in the Wensum valley was simply too remote from their great castles at Thetford and Norwich. 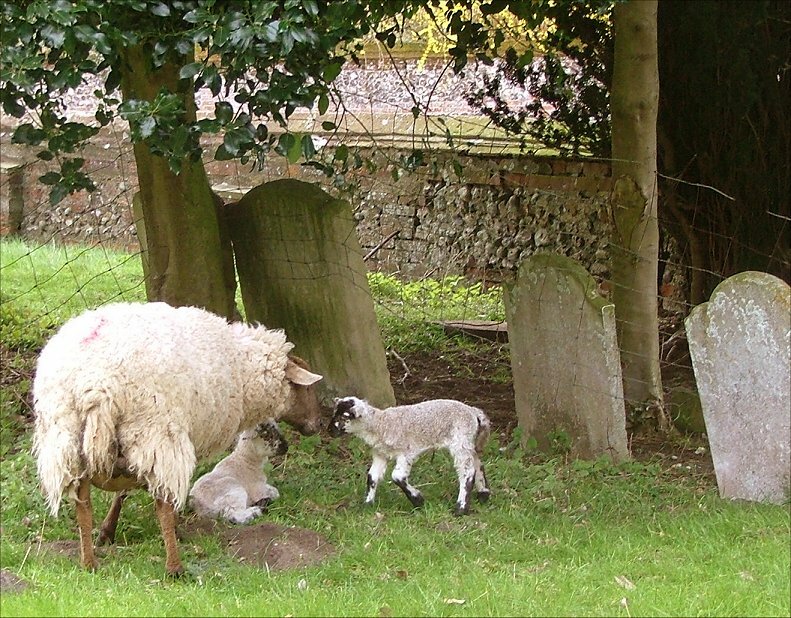 Even sleepier today, the graveyard of St Mary is home to wandering sheep and their lambs, and it feels a long way from anywhere. 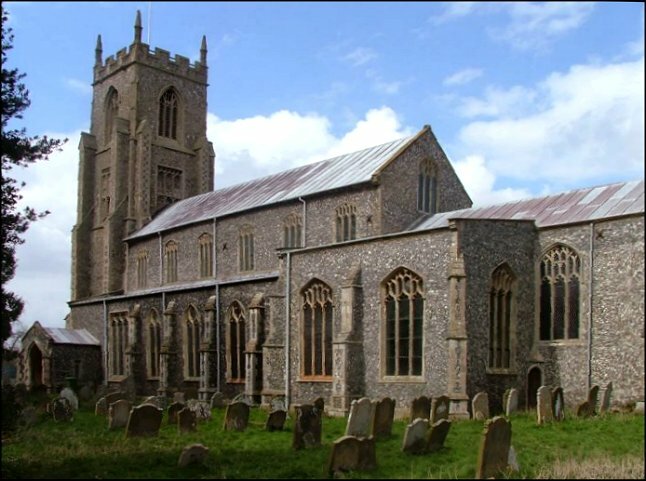 But as if to make up for it, St Mary is a vast Perpendicular church, as big as a small cathedral, a solid and buttressed example of the best that Norfolk craftsmen could do. Not far off from the church is the ruin of a Norman chapel. 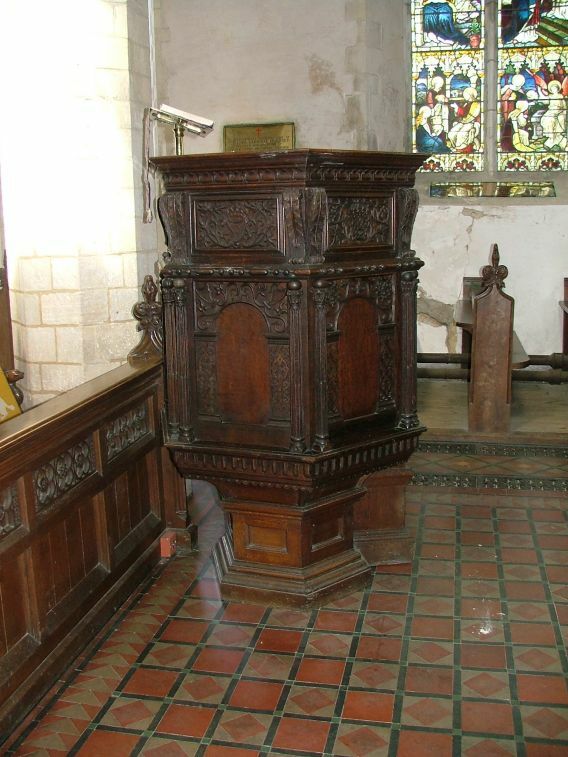 This was built by Herbert de Losinga, first Bishop of Norwich, whose country retreat was here. The chapel served his house, but one of his successors, the late 14th century Hugh Despencer, built a larger fortified house on the site of the chapel. The mingled ruins of these two buildings are pleasant to explore, and the view back across the village to the tower of St Mary is a good one. The ruins serve as a reminder that even after the See was moved, North Elmham was still a place of some importance. 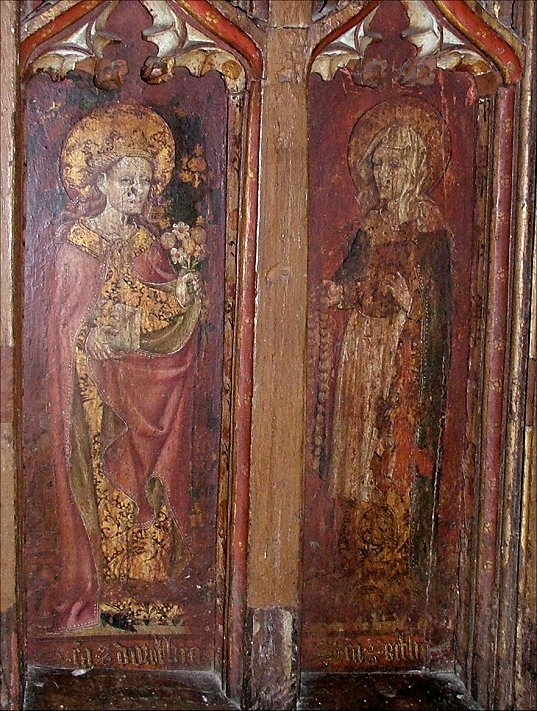 And the building of de Losinga's chapel probably led indirectly to the the building of St Mary, as we will see. 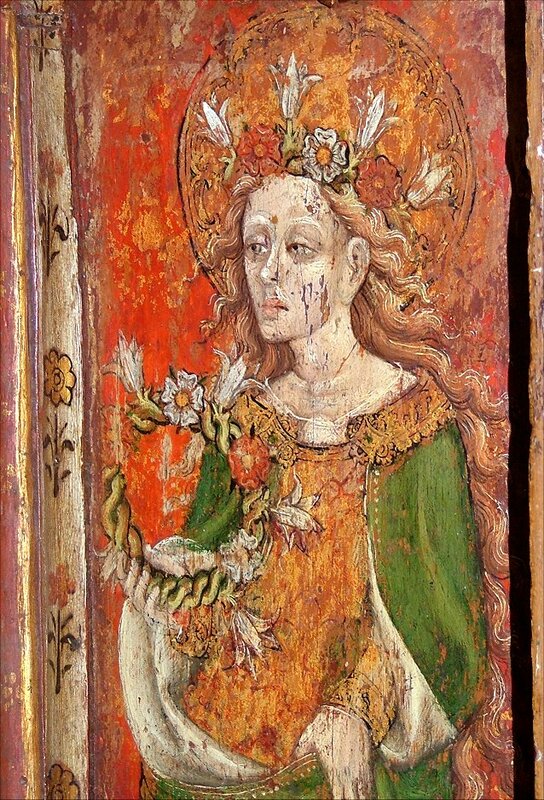 As you approach St Mary, you begin to see that all is not quite as it seems. The crispness of the exterior of what appears a 15th century building stems from a refacing with flint in the 19th century, but there are a number of little details that show that much of the building predates its apparent late medieval construction. 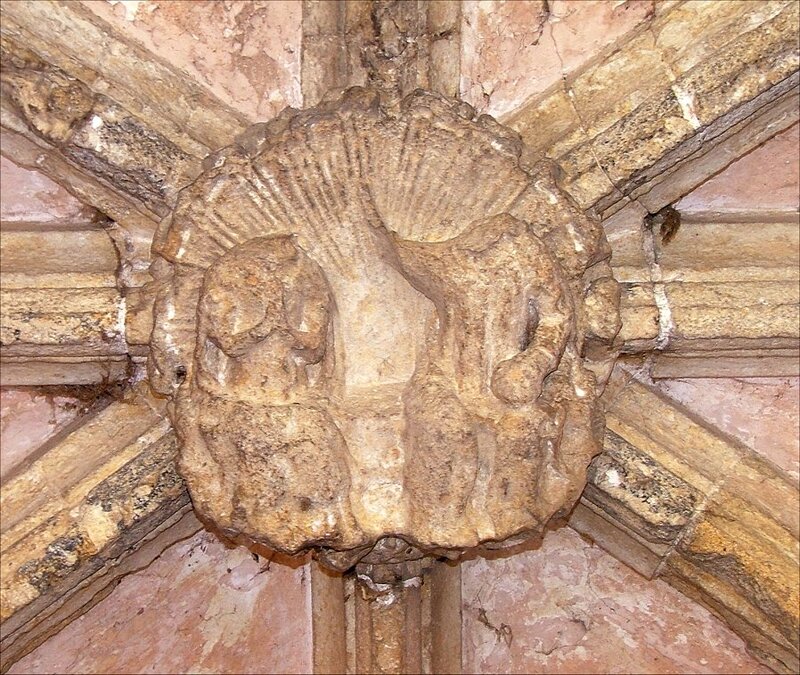 The south porch is vaulted, and there is a very fine boss of the Coronation of the Queen of Heaven - unfortunately, both the main figures have had their heads removed. 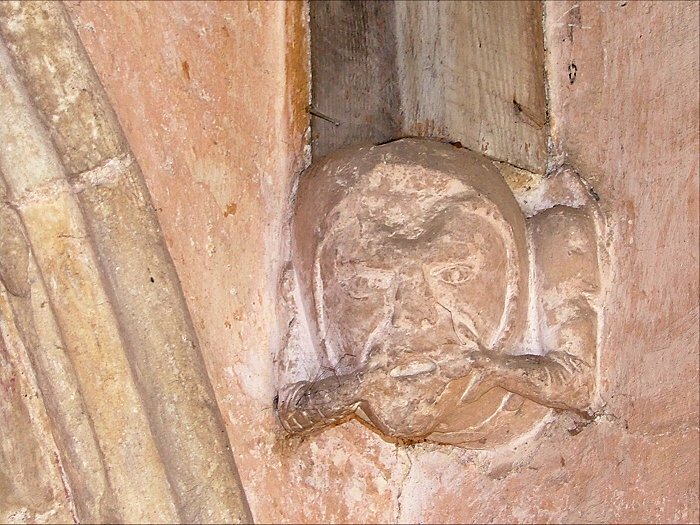 In contrast is the rather primitive grotesque forming a headstop to the south doorway. 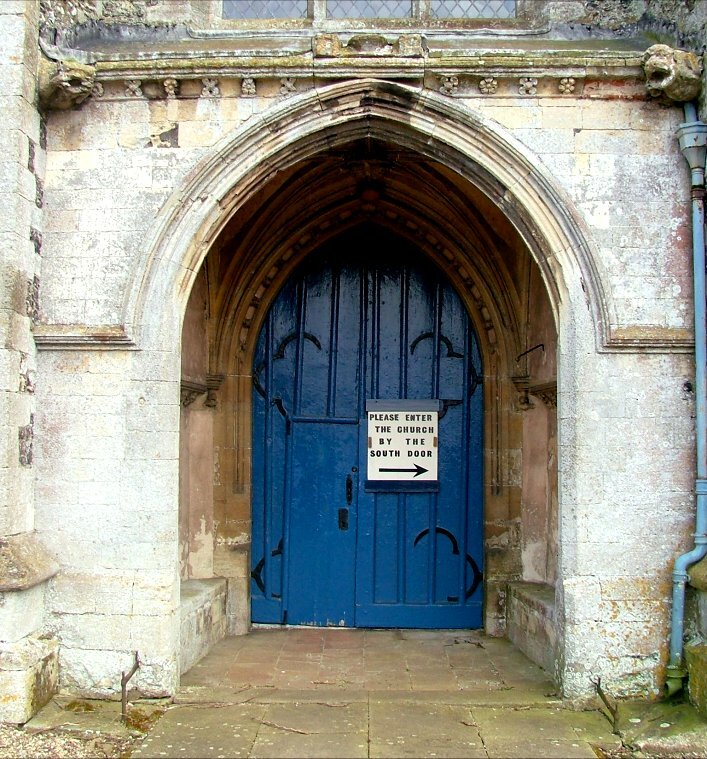 This is much earlier, telling you that this entrance was here in the late 1200s. 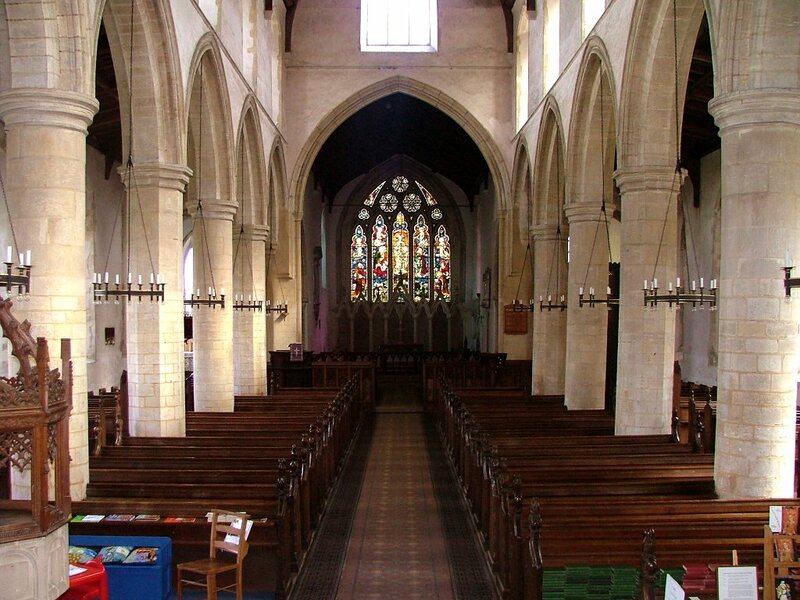 In fact, this was the time the nave was built. 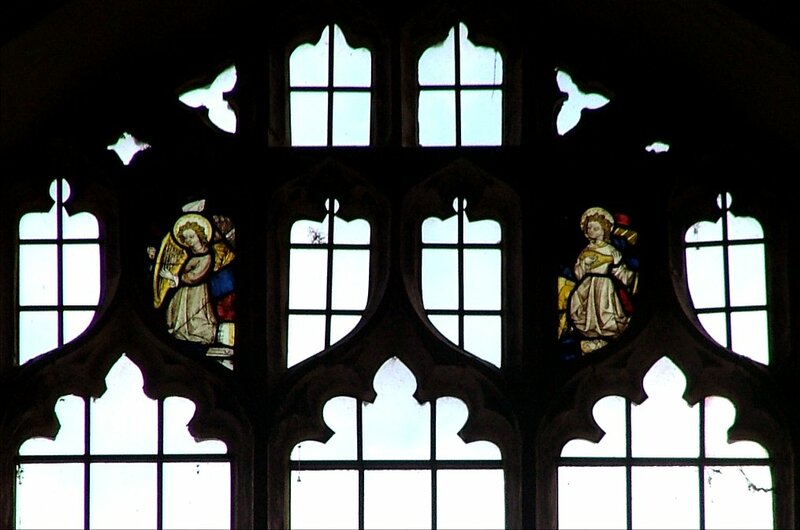 Large medieval churches can be made very urban and anonymous by insensitive 19th century restorations. 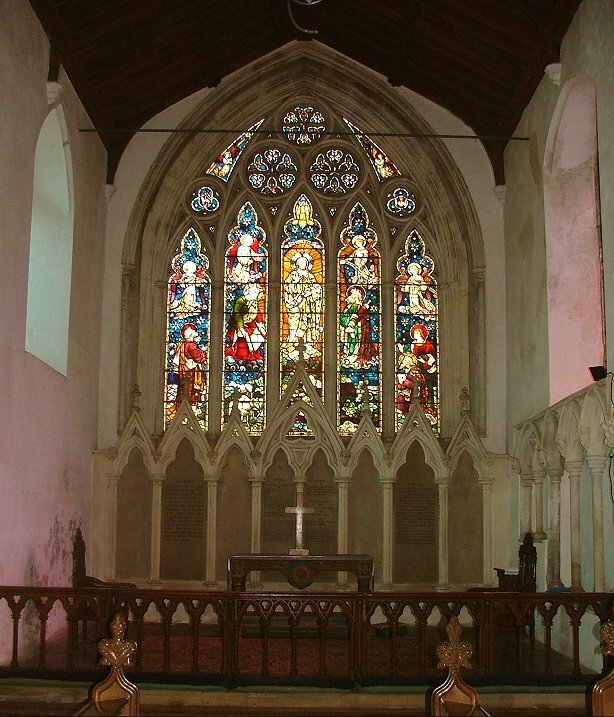 The work here at North Elmham was considerable but early, by John Brown in 1852, and it has left the interior a light, peaceful place, quite at ease with itself. 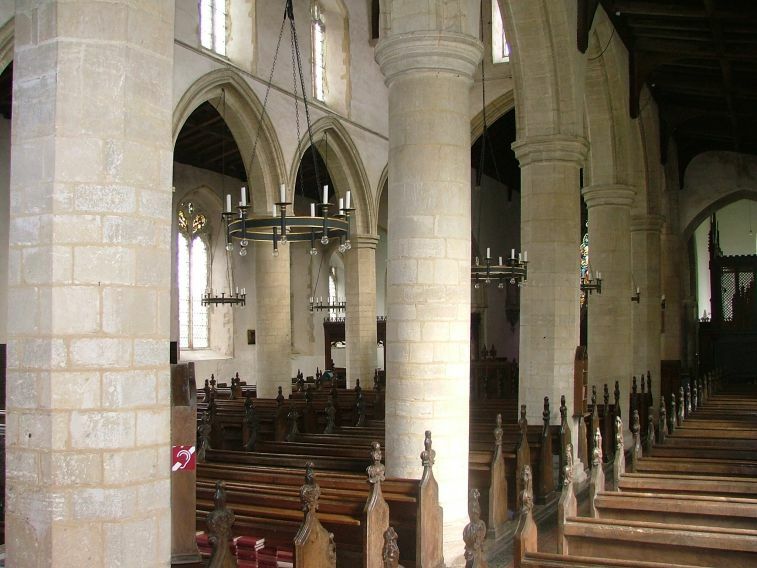 The most striking feature is that the arcades have alternating round and octagonal pillars, which I don't think I've seen anywhere else in Norfolk. The huge exterior and the south doorway hide the fact that there was a church here even earlier, because the responds at the east end of both arcades are Norman. 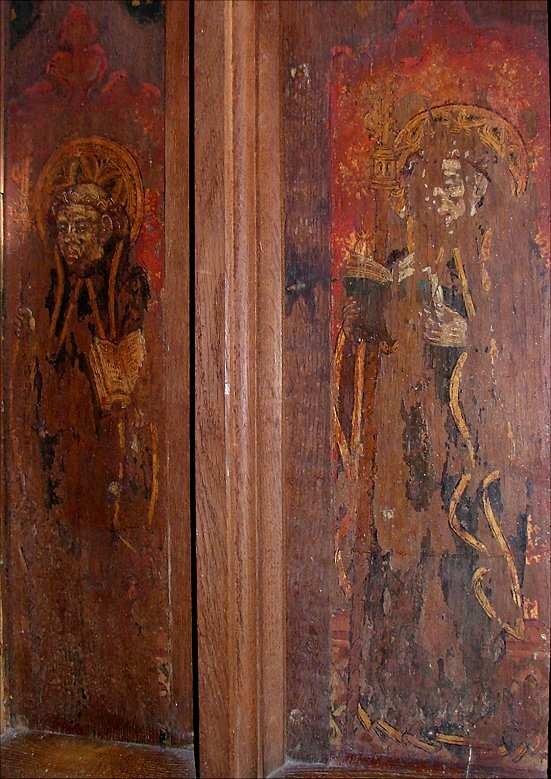 Pevsner suggests that what probably happened was that the parish used the old wooden Cathedral after the see was moved, but when de Losinga built his house and chapel he also paid for a new parish church, probably about 1100. Pevsner thinks that the work on his house and chapel must have necessitated the removal of the old Cathedral, suggesting that it was on the same site as the house. 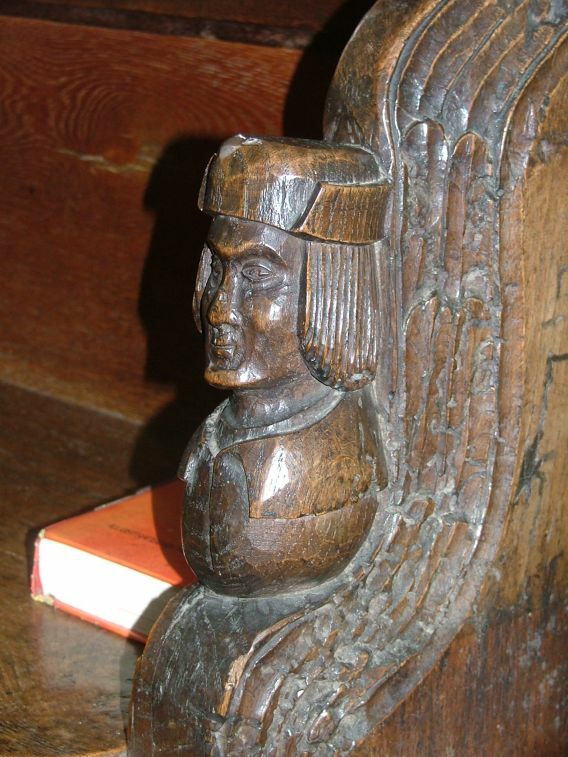 Not much else survives from de Losinga's time, or even Despencer's, but there are a number of fine late medieval survivals that give you an indication of the glory that was once here. 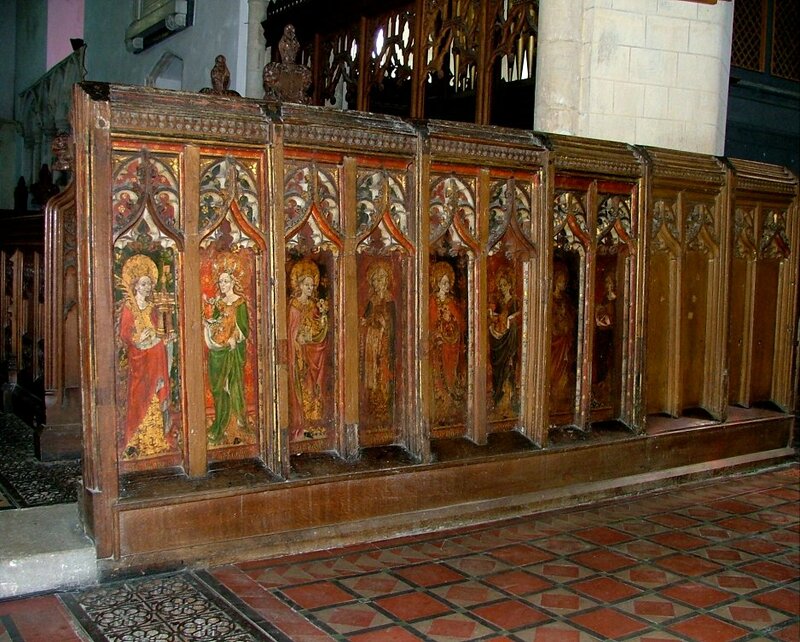 The best of these is the rood screen dado. 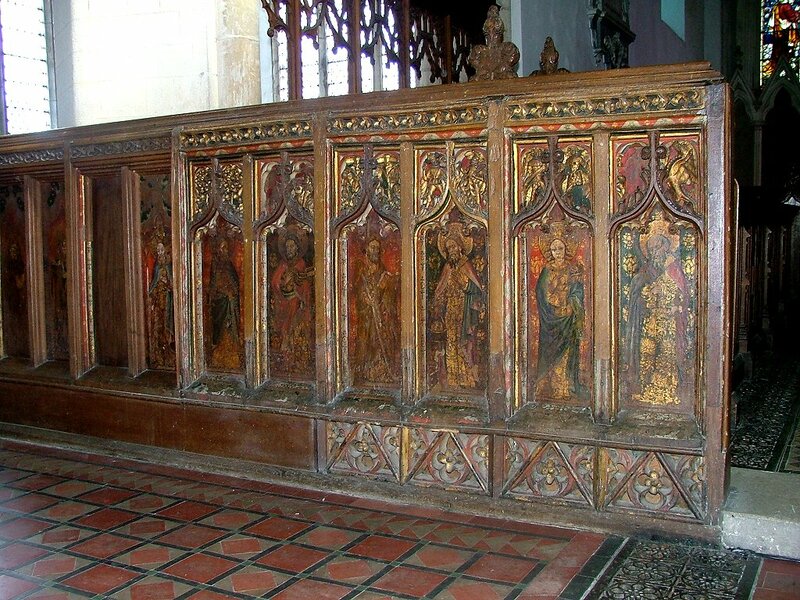 The panels are wide and ornately cusped, the original reds, greens and golds showing boldly. 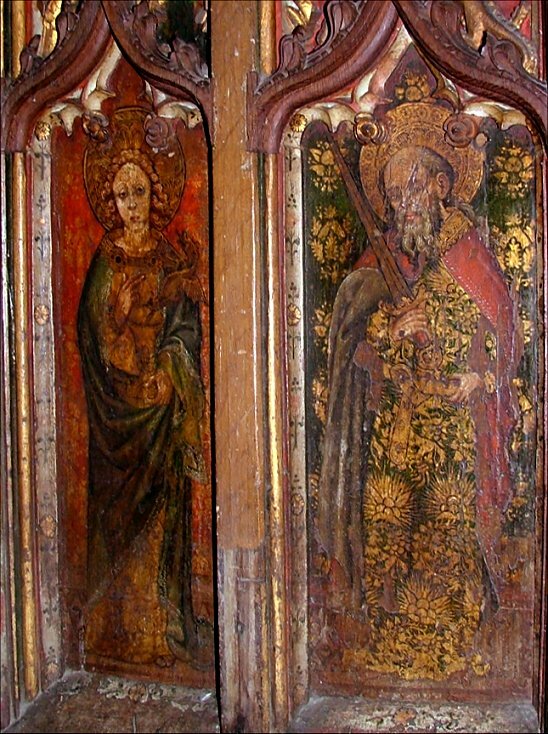 They spent several centuries being used as flooring, but were rescued by John Brown during the 1852 restoration, and reset at the east end of the nave some thirty years later. It is hard to tell if the dado is in its original place, because it is so vast and stretches beyond the arcades. There are 24 panels in all, of which 17 have figures on. 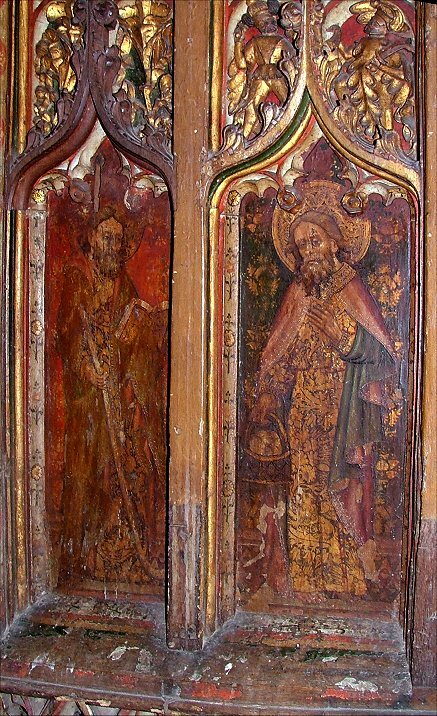 After two blank panels at the far north are St Benedict and a Doctor of the Church, probably St Augustine or St Ambrose. 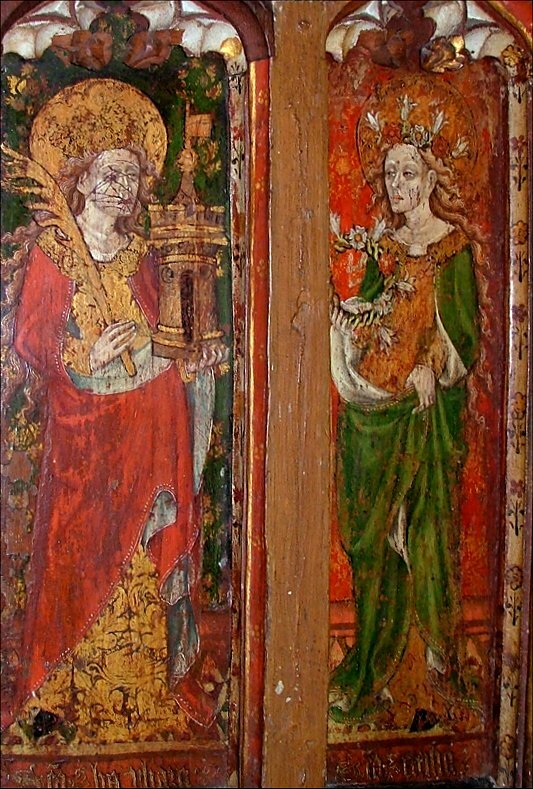 Then, after a missing figure, (indeed, the whole panel is missing) come St Thomas on his own with a spear, St Bartholomew with a flencing knife and St Jude with a boat, St James the Less with a fuller's club and St Philip with his loaves, and lastly St John the Evangelist with the poisoned chalice and St Paul with a sword. 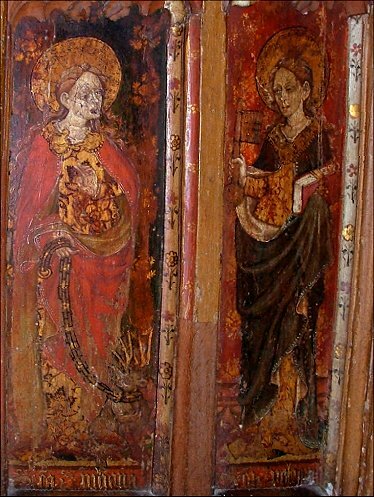 Over on the south side are St Barbara with her tower and St Cecilia with her floral wreath, St Dorothy with her flowers and St Sitha with her beads, St Juliana with a dragon on a chain and St Petronilla with a book and a large key, St Agnes pierced through the neck holding a lamb and and finally a figure identified as St Christina, shot through with arrows, who appears to have been an amalgam of St Catherine and St Sebastian. The last four panels are missing. Clearly, the complete range should include five more disciples and perhaps the other Doctors. The sculpture in the spandrils above is even more intriguing. 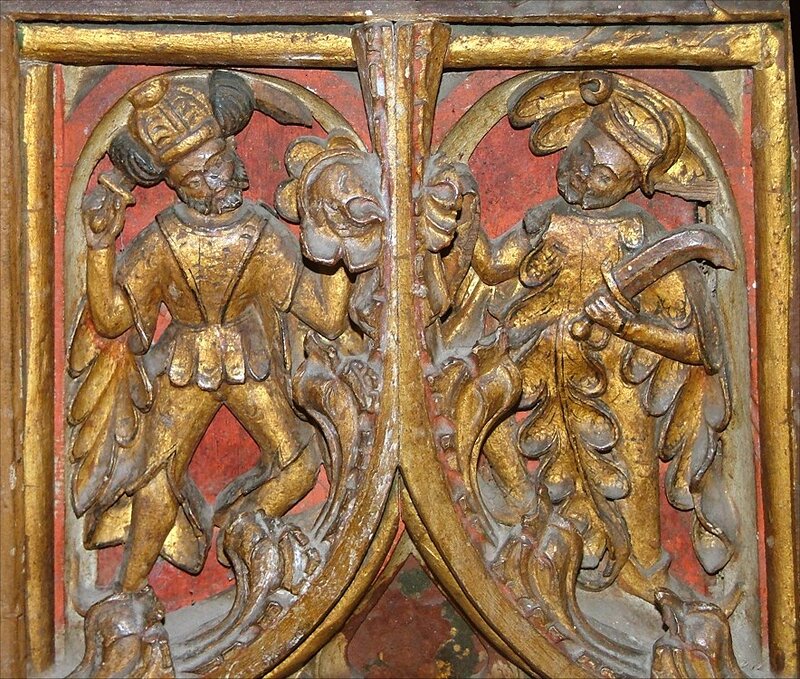 Two figures fighting appear to be a Turk and a Moor, and an almost destroyed St George dispatches a dragon. Most curious of all, one depicts a cloaked man riding a pig. 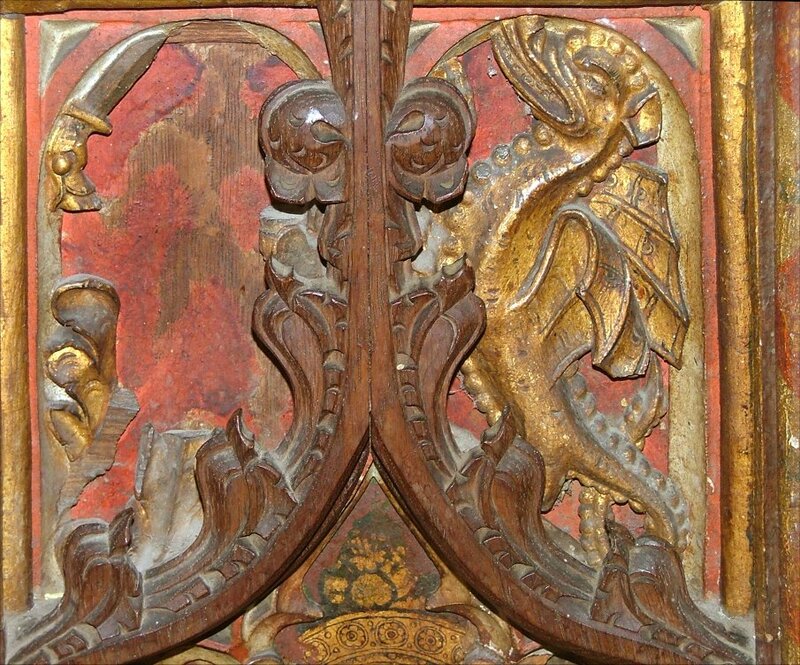 It would be interesting to know what was in the matching spandril, which is completely defaced. 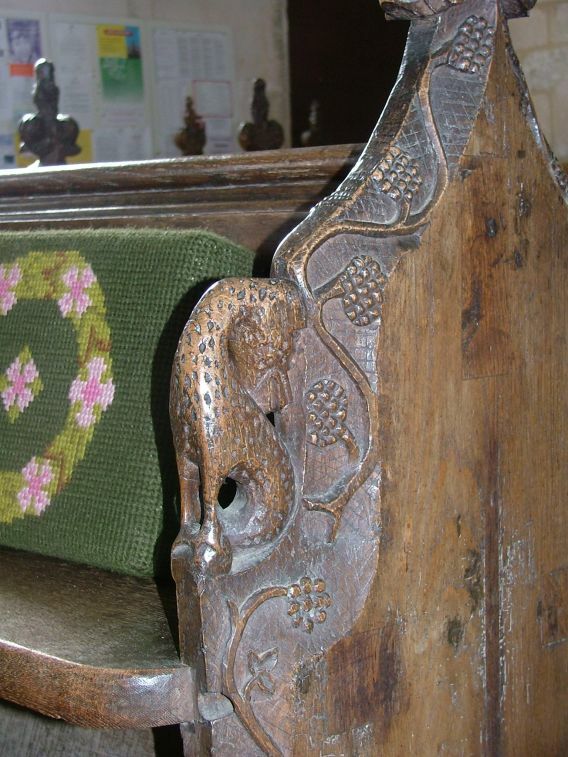 The Victorian character of the nave distracts a bit from what is actually quite a nice collection of 15th century bench ends, including a chained bear and, of all things, a giraffe. 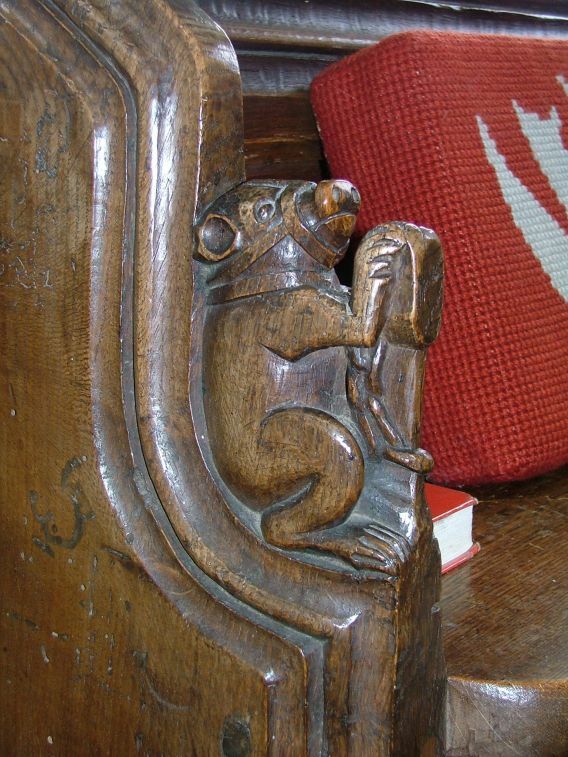 The person who carved this had obviously never seen one - he thought it would have a floppy neck. 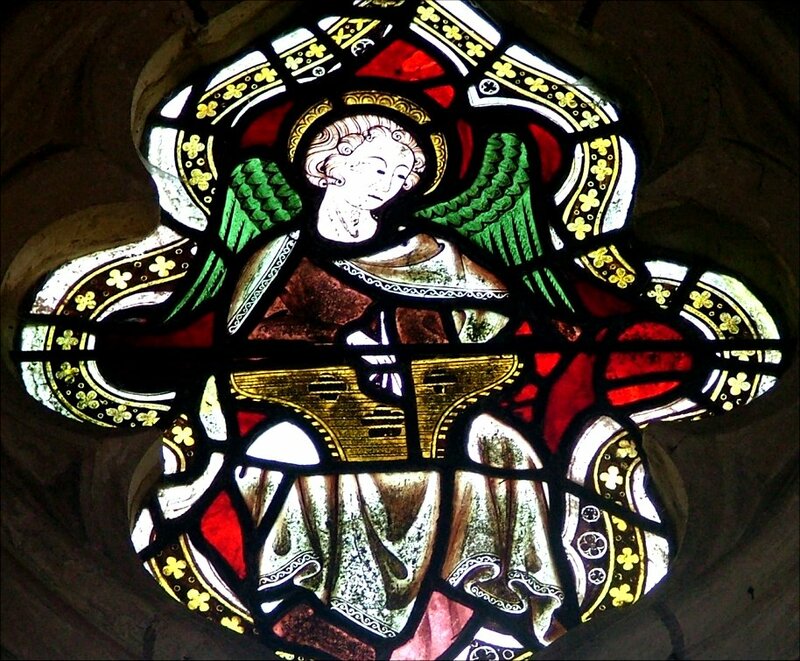 There is a smattering of stained glass; two angels playing musical instruments are set high above the chancel arch in the window that once back-lit the rood. 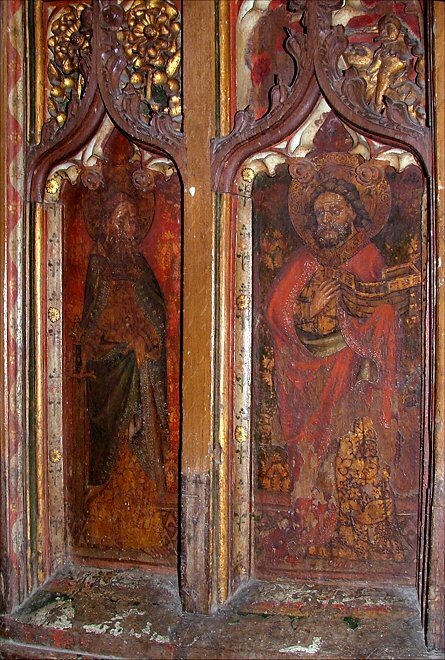 They look 15th century, but there are two larger, earlier figures which may date from the early 14th century. 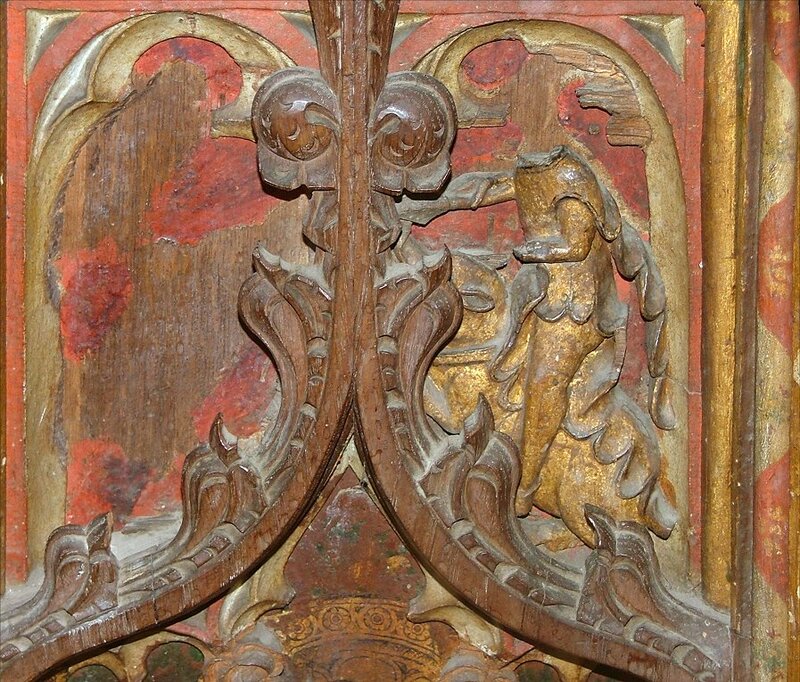 One is an angel playing a zither, and the other an exquisite but sadly eroded Madonna and child. The restoration of the chancel must have come after that of the nave, I think. 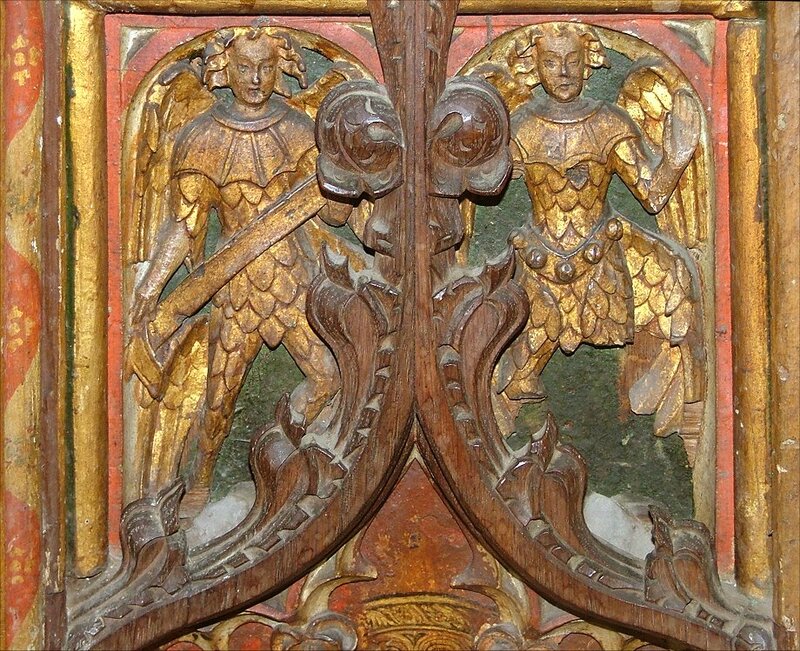 It is less restrained, and the pointy stone reredos is really rather ugly. 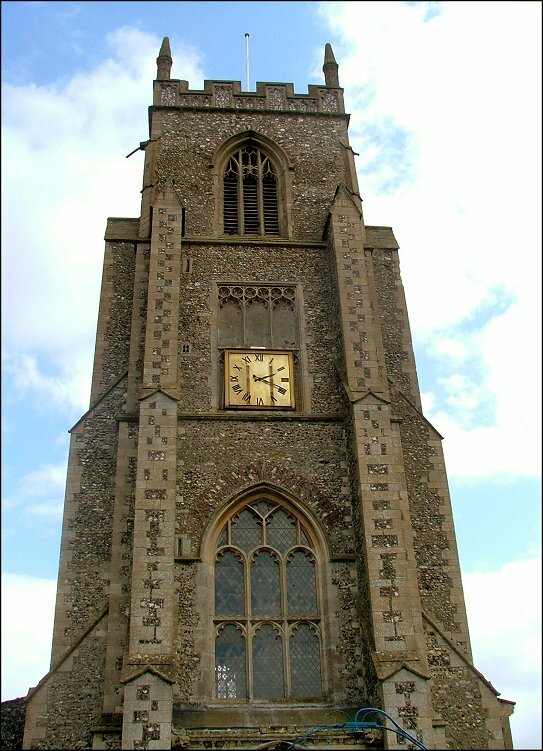 A church in the Anglo-catholic tradition might just get away with it by dressing it up, but I got the impression that North Elmham is rather low church, and as a result the east end looks rather bleak. 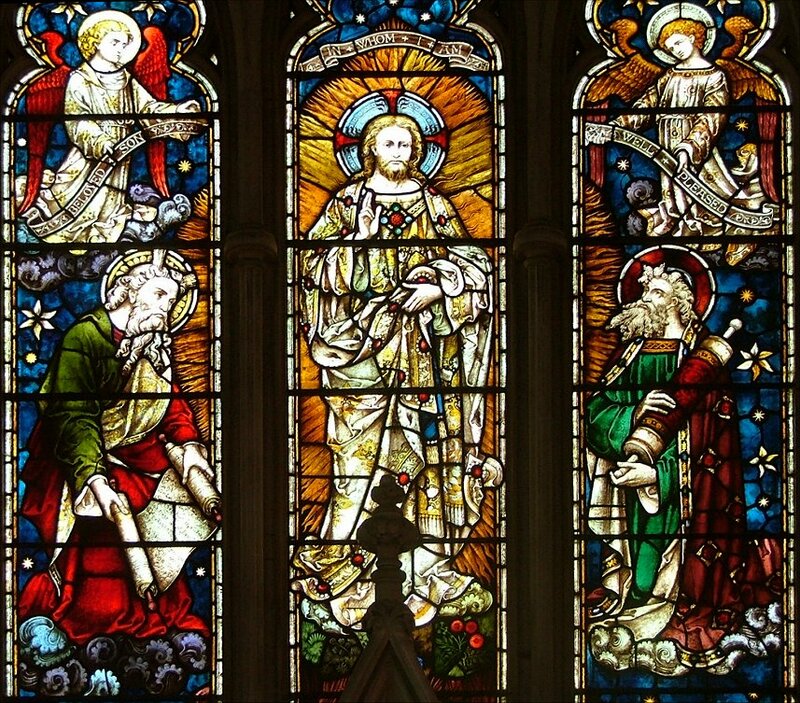 But this is a small point, and the decent glass in the east window above goes some way to making up for it. 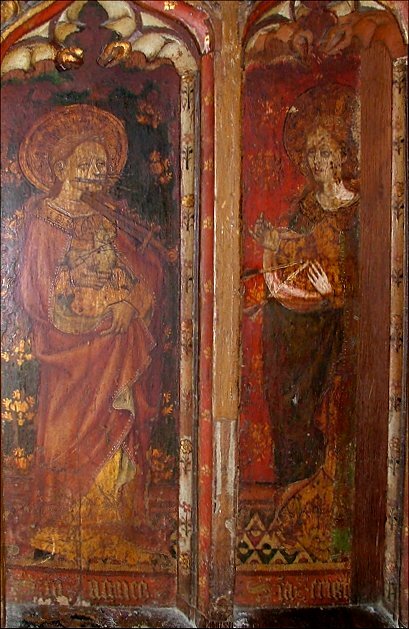 It depicts the Transfiguration, an unusual subject although it is also in the neighbouring parish church at Billingford. 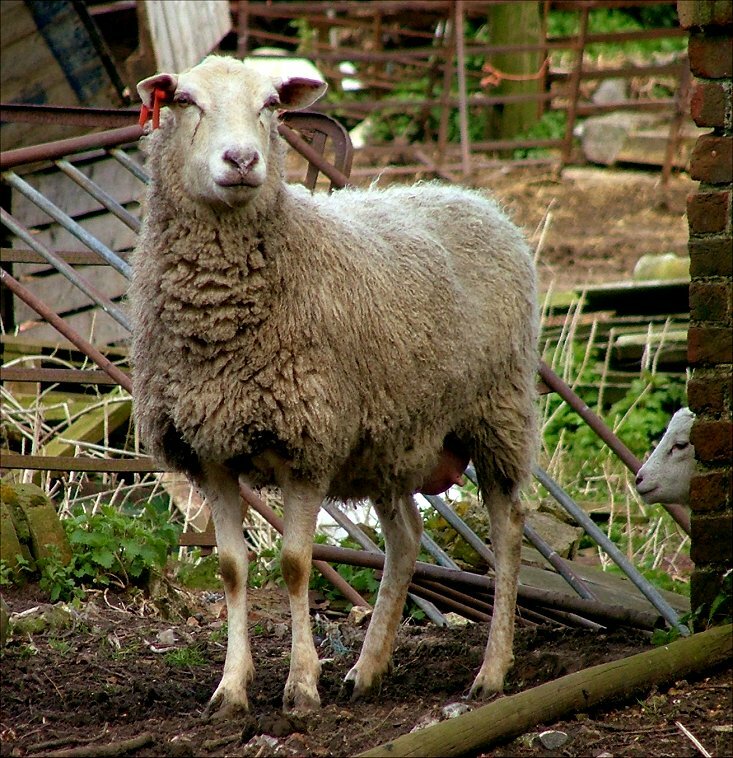 North Elmham is one of those reassuring places, with a sense of permanence and a confidence in its own story. A lot has happened here; less happens today, and that's no bad thing.